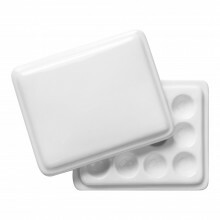 Ceramic watercolour palettes are sturdy, long-lasting and easy to clean. They are best suited for painters working indoors. The paint is easily wiped from the palette, and provided it is not dropped, it will last a very long time.